I came across the large scale container garden just a few streets away on my daily walk. I don’t usually walk this particular street , but I am surprised I hadn’t happened upon it before. 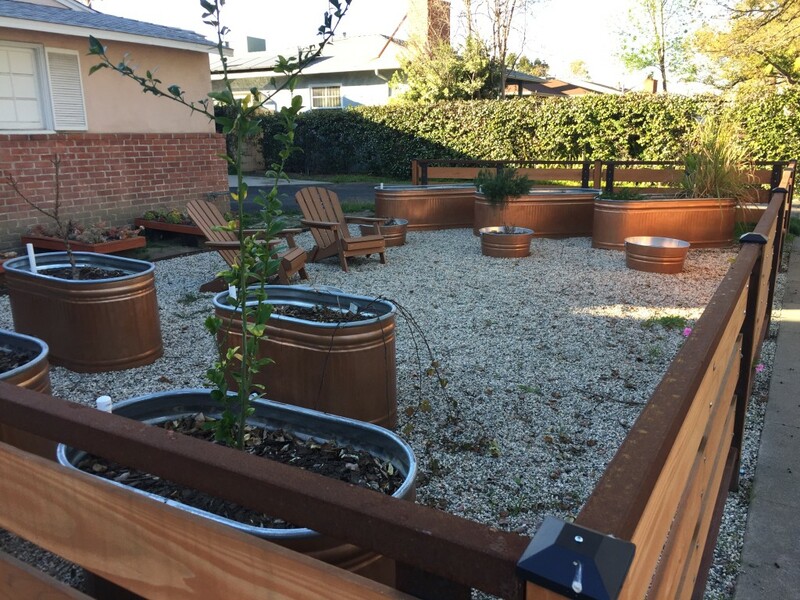 As you can see, it is elegantly laid out, using long, galvanized steel watering tanks as beds, as well as a few smaller, traditional raised beds with wooden sides. The remainder of the garden is mulched with stone. I love that they also included the 2 comfortable chairs, something every garden should have. I love the layout of the watering tank beds. It gives some interest to the garden while still being functional. I am guessing they painted the troughs, as I have only seen them in their default galvanized state on most web sites, not this nice copper color. This garden faces East so it sits a bit in shade at the time I walked by this afternoon. It looks like they are just getting started, as the plantings are pretty slim at the moment. I’ll check back over the coming weeks to see how they grow it out. This is a different take on the other drought-tolerant landscaping I am seeing in the neighborhood, and certainly not to everyone’s tastes, but I could easily see it in my own garden, should I ever need to start over or extensively retrofit what I have right now. Categorized under: Container Garden Update, Design, DIY, Education, In the neighborhood, Landscape, Photos, Projects.